The cold open of Goldfinger has in it seemingly every James Bond trope. Bond (Sean Connery) sneaks and fights his way into a guarded facility. He uses a gadget to blow something up (for God knows what reason). Then, he strips down to a white suit and diffuses into the social world, where he rendezvouses with another agent. There’s also an attractive woman dancing, just for good measure. A woman Bond then attempts to bed, only to be approached from behind by an armed assailant. And, as always, the altercation ends in a one-liner. It is James Bond in a nutshell. Following this cold open, we get one of the better Bond opening title sequences. A stark black background and projected film footage casts gold-painted women in shadows. All the while, Shirley Bassey’s voice erupts above the stagnant visuals. It isn’t hard to see why her song is now so iconic. Goldfinger establishes the hero-villain relationship expediently, perhaps learning to do so after the first two Bond films did it rather poorly. Where in Dr. No we aren’t exposed to the eponymous villain until very late, and in From Russia With Love we don’t get a glimpse of Bond until 20 minutes in, we are neatly established with Bond and Goldfinger (Gert Frobe and Michael Collins (voice)) within the first 15 minutes of the movie. And the scene in which they become acquainted is fun to watch, as Bond sabotages Goldfinger’s card game and seduces his paid henchwoman in one fell swoop. Speaking of henchpersons, Goldfinger has one of the more iconic henchman in the series in Oddjob (Harold Sakata). His entrance is a perfectly shot introduction. All we see are the physical traits that define him: a close up of his encroaching palm and a shadow that reveals his top hat. Then, without warning, Bond is incapacitated and the shadow disappears. The scene immediately following this introduction is perhaps the most famous in the Bond oeuvre. It is positioned beautifully with the preceding scene in order to make for a dark surprise. People who have never watched a Bond film still know of this scene, and, as a viewer, it cues you in to the fact that this third Bond film isn’t messing around. 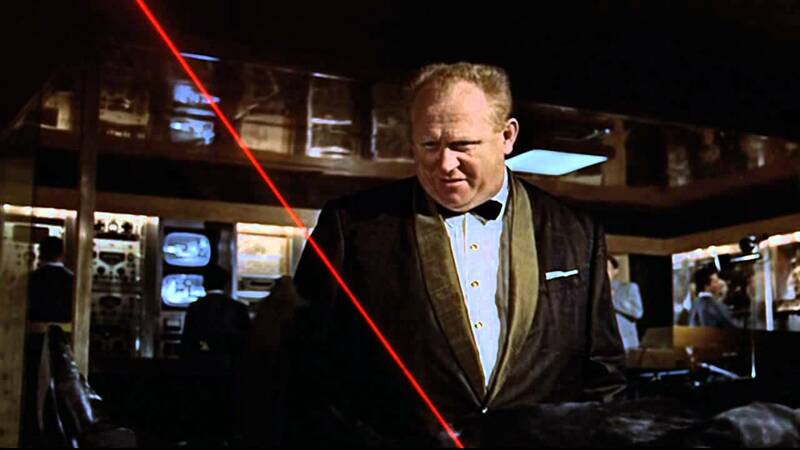 The progression of the Hollywood action film is evident in Goldfinger. Comparing a car chase scene in this film to the one in Dr. No, which came out just two years earlier, we see an immense upgrade in stunt work and camera work. The camera angles make the chase look more realistic, as opposed to the straight on and painfully obvious rear projected shots we get in Dr. No. And the cars simply move more cinematically in the space they’re in. The whole scene is more of a spectacle. The film as a whole shows this progression. Even compared to From Russia With Love, Goldfinger is superior in its pacing, which is created by quicker cuts and faster narrative development. Action scenes are no longer the clunky ones they were in Dr. No. The action is faster and more intense. The sound work, for which this film won an Academy Award, notably enhances the intensity of these scenes with every tire squeal and gunshot. Sound as a whole plays an extraordinary role in the film. In one of the more climactic–and, again, iconic–moments, the string score embellishes to a powerful yet still somewhat somber pulse. In this scene–one that employs a certain laser–there are periods of time where the score is the only sound we hear. It dominates the ear, forcing our attention to the danger at hand for Mr. Bond. Dialogue will cut in, then the score will respond before another character gets a chance to. It is a driving force that, without it, would leave the scene noticeably lacking in suspense. Connery, again, gives a strong performance as the franchise spy. Frobe also comes through as the titular baddie, catapulting him to one of the franchise’s most successful villain portrayals. What is most notable, however, is the character of Tilly Masterson (Tania Mallet). Attempting to avenge the untimely death of her sister, Masterson is perhaps the first female Bond character to be portrayed as strong and not simply eye candy (or otherwise evil). Of course, this somewhat changes when she comes into contact with Bond, but for a time her character is intriguing and not used simply as a tool for misogyny. Taking the casual misogyny with a grain of salt, which one must do to even remotely enjoy these early Bond films, there is a lot cinematically to be impressed with in Goldfinger. Editing, sound, and acting are all noteworthy layers to pick apart. Every scene has something worthwhile in it. And, for better or worse, this film lays the framework for the usual Bond film. Many Bond films hereafter are parodies of or failed attempts at living up to Goldfinger. Goldfinger is currently available to rent/buy on Amazon Video here . Have you seen Goldfinger? If so, what did you think? What are your favorite James Bond films? Let me know in the comments!